EAST VILLAGE — A $6.5 million three-floor apartment that was built to accommodate its 6-foot-9 original owner just went on the market in the East Village, a broker said. The top three floors of the custom-built, five-story townhouse at 56 E. First St. have 20-foot ceilings and two terraces overlooking Houston Street, designed to give plenty of room to the California man who raised the building from an empty lot in 2005. The original owner loved the East Village but hated living in its cramped apartments, said Chad Thomas, a broker for Town Real Estate. The eco-friendly townhouse has a storefront on the ground floor and a tenant in a separate apartment on the second floor. The 2,400-square-foot three-bedroom, two-bathroom home spans the third through fifth floors. "This is such a unique place," Thomas said. 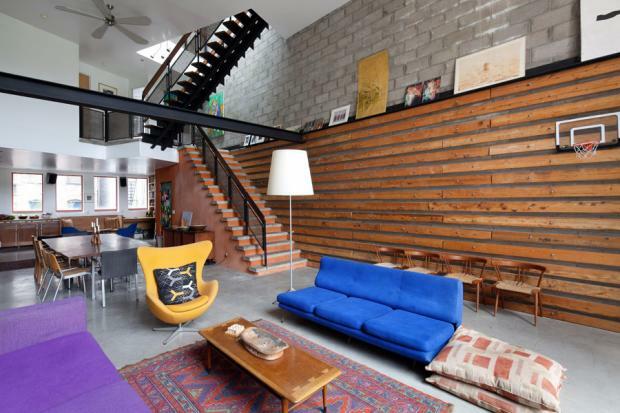 With large windows to let in lots of light and air, the townhouse was built mostly from repurposed materials, including cobblestone that came from an empty lot and wood that came from old water towers. Concrete floors keep the space cool in the summer, but include built-in heating tubes to warm the space in the winter, Thomas said.